It is very common that your iPad data can be unintentionally deleted for some reason or another. Apart from jailbreak, iOS upgrade, factory reset, virus attack, or just you click the wrong button on iPad accidentally, all these can give rise to the iPad data erased suddenly. Then you are so eager to retrieve the lost data timely. It’s very lucky for you to be here. We will show you a trustworthy tool – Free iPad Backup Extractor, which can help you to recover data, including photos, videos, contacts, messages, notes, and so forth from iPad backup. However, you should ensure that you have backed up iPad with iTunes previously. Now follow the steps below to learn how to use this tool in details. Step1. 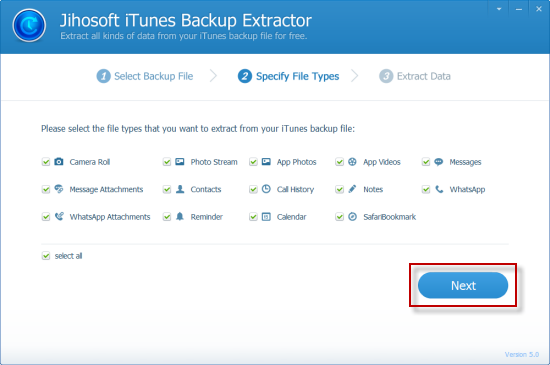 Download and run the software – Free iPad Backup Extractor, then choose the iPad backup that you want to extract data from, and click “next”button to proceed. Step2. 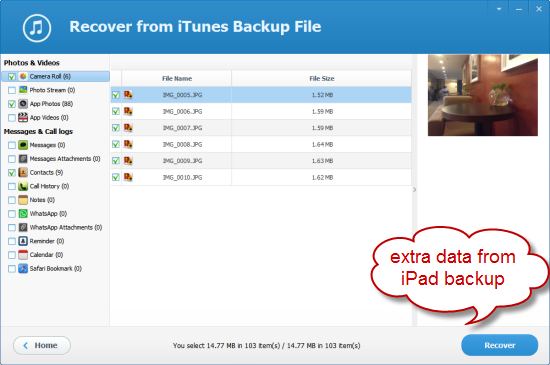 Select the data types that you would like to extract from the iPad backup, and then click “next”button. For example, if you only want to extract photos from your iPad backup, then select “Camera Roll” and “Photo Stream” only. This will greatly improve the extraction speed. Step3. After all the selected file types are extracted from the backup, you can preview them with details. Select the files you want and click the “Recover” button. 1. 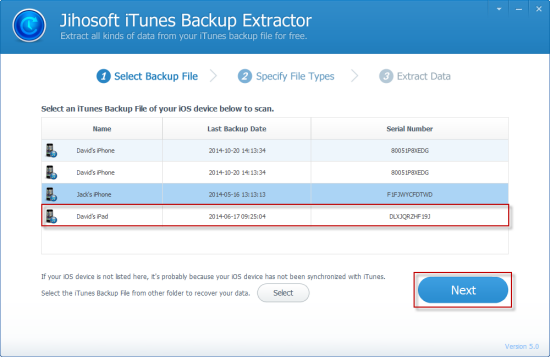 Free iPad Backup Extractor Tool lets you view and extract data from iPhone/iPad/iPod backup created by iTunes. 2. No necessary to connect your iPad to computer directly, so it’s very convenient for you to view and extract iPad backup data if your iPad is broken or stolen. 3. Preferential option to preview the files that you want to extract, like photos, videos, messages, contacts, call history, notes, Whats App, and so forth. Then you can selectively retrieve the ones in your favor. 4. Totally free with comfortable and reliable experience. 5. It supports extracting various types of data from the backup of iPad, iPhone, iPod touch devices. Please keep up in mind that BACK UP THE IPAD on your computer is a must. So you can retrieve deleted data from iPad backup if your iPad is stolen or unexpected damaged. If you are keen on knowing more information about our products, we are very glad to serve for you at first time via support@jihosoft.com.